In the manufacturing industry, there is an urgent need to shorten the manufacturing lead time of products. Therefore, optimizing process planning is essential to realize high efficiency machining. In this study, in order to develop a computer aided process planning (CAPP) system using previously proposed machining features, a prediction method for some process evaluation indices is proposed. Many candidates for the machining process exist, depending on the recognized machining features in a previous study. Therefore, by using these indices, operators can select a suitable process from among these candidates according to their ideas. Case studies of process planning are conducted to confirm that the operator’s strategy affects the selection of the machining process candidates. 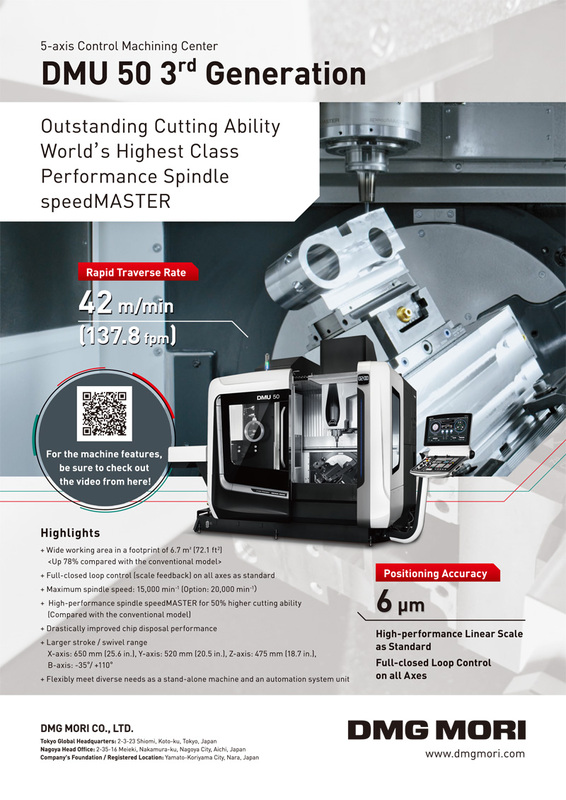 From the case study results, it is found that the proposed process evaluation indices have potential use in determining the machining process utilized, and are suitable for a flexible CAPP system of multi-tasking machine tools. K. Koremura, Y. Inoue, and K. Nakamoto, “Machining Process Evaluation Indices for Developing a Computer Aided Process Planning System,” Int. J. Automation Technol., Vol.11, No.2, pp. 242-250, 2017. E. Morinaga, M. Yamada, H. Wakamatsu, and E. Arai, “Flexible Process Planning Method for Milling,” Int. J. of Automation Technology, Vol.5, No.5, pp. 700-707, 2011. K. Dwijayanti, and H. Aoyama, “Development of Automatic Process Planning System for Turning-Milling Center with 2 Turrets System,” J. of the Japan Society for Precision Engineering, Vol.81, No.5, pp. 471-480, 2015. L. Wang, M. Holm, and G. Adamson, “Embedding a process plan in function blocks for adaptive machining,” CIRP Annals-Manufacturing Technology, Vol.59, No.1, pp. 433-436, 2010. Y. Woo, E. Wang, Y. S. Kim, and H. M. Rho, “A Hybrid Feature Recognizer for Machining Process Planning Systems,” CIRP Annals-Manufacturing Technology, Vol.54, No.1, pp. 397-400, 2005. J. Zhu, M. Kato, T. Tanaka, H. Yoshioka, and Y. Saito, “Graph based automatic process planning system for multi-tasking machine,” J. of Advanced Mechanical Design, Systems, and Manufacturing, Vol.9, No.3, 15-00296, 2015. S. Igari, F. Tanaka, and M. Onosato, “Computer-Aided Operation Planning for an Actual Machine Tool Based on Updatable Machining Database and Database-Oriented Planning Algorithm” Int. J. of Automation Technology, Vol.6, No.6, pp. 717-723, 2012. K. Dwijayanti, and H. Aoyama, “Basic study on process planning for Turning-Milling Center based on machining feature recognition,” J. of Advanced Mechanical Design, System, and Manufacturing, Vol.8, No.4, 14-00095, 2014. K. Kubota, T. Kotani, K. Nakamoto, T. Ishida, and Y. Takeuchi, “Development of CAM System for Multi-tasking Machine Tools,” J. of Advanced Mechanical Design, Systems, and Manufacturing, Vol.4, No.5, 10-0015, 2010. K. Nakamoto, K. Shirase, H. Wakamatsu, A. Tsumaya, and E. Arai, “Automatic Production Planning System to Achieve Flexible Direct Machining,” JSME Int. J., Series C, Vol.47, No.1, pp. 136-143, 2004. E. Morinaga, T. Hara, H. Joko, H. Wakamatsu, and E. Arai, “Improvement of Computational Efficiency in Flexible Computer-Aided Process Planning,” Int. J. of Automation Technology, Vol.8, No.3, pp. 396-405, 2014. M. M. Isnaini, K. Shirase, “Review of Computer-Aided Process Planning Systems for Machining Operation – Future Development of a Computer-Aided Process Planning System –,” Int. J. of Automation Technology, Vol.5, No.5, pp. 317-332, 2014. J. H. Han, M. Platt, and W. C. Regli, “Manufacturing Feature Recognition from Solid Models: A Status Report,” IEEE Trans. on Robotics and Automation, Vol.8, No.3, pp. 782-796, 2000. B. T. Sheen and C. F. You, “Manufacturing feature recognition and tool-path generation for 3-axis CNC milling,” Computer-Aided Design, Vol.38, pp. 553-562, 2006. K. Shirase and K. Nakamoto, “Simulation Technologies for the Development of an Autonomous and Intelligent Machine Tool,” Int. J. of Automation Technology, Vol.7, No.1, pp. 6-15, 2013. M. M. Isnaini, Y. Shinoki, R. Sato, and K. Shirase, “Development of a CAD-CAM Interaction System to Generate a Flexible Machining Process Plan,” Int. J. of Automation Technology, Vol.9, No.2, pp. 104-114, 2015. A. Ueno and K. Nakamoto, “Proposal of machining features for CAPP system for multi-tasking machine tools,” Trans.s of the Japan Society of Mechanical Engineers, Vol.81, No.825, 15-00108, 2015 (in Japanese). H. Narita, H. Kawamura, T. Norihisa, L.Y. Chen, H. Fujimoto, and T. Hasebe, “Development of Prediction System for Environmental Burden for Machine Tool Operation,” JSME Int. J., Series C, Vol.49, No.4, pp. 1188-1195, 2006. H. Narita, “A Method for Using a Virtual Machining Simulation to Consider Both Equivalent CO2 Emissions and Machining Costs in Determining Cutting Conditions,” Int. J. of Automation Technology, Vol.9, No.2, pp. 115-121, 2015. H. Narita and H. Fujimoto, “Analysis of Environmental Impact due to Machine Tool Operation,” Int. J. of Automation Technology, Vol.3, No.1, pp. 49-55, 2009. A. Hayashi, R. Iwase, R. Sato, and K. Shirase, “Measurement and Simulation of Energy Consumption of Feed Drive Systems,” J. of Mechanics Engineering and Automation, Vol.4, No.3, pp. 203-212, 2014.